Wanted: Someone to supervise 300 kids 24/7 during summer, take 22 rowdy college boys cross-country to win a soccer championship in the fall, marry a couple on Saturday, christen a newborn on Sunday, keynote a corporate speech to hundreds first thing Monday and pull votes for a stadium initiative on Tuesday. Ten fingers not necessary. Sense of humor a must. Unless your name happens to be Charles Clifford McCrath, there’s no need to apply. On Saturday, Feb. 11, a true treasure of Seattle and soccer, Cliff McCrath, will be inducted into Seattle Pacific University’s Falcon Legends Hall of Fame. McCrath knows the drill. After all, it’s his 10th such enshrinement around the country. Unlike the others, however, this will be celebrated on his turf, where since arriving 47 years ago he grew to be an outsized figure capable of accomplishing amazing feats for a sport that, at times, struggled to take hold. McCrath figures to be both feted and humbled during the ceremony. His induction class includes two former colleagues, John Glancy and Virginia Husted, plus the first (1978) of his five NCAA championship teams. McCrath celebrates with Seattle Pacific players following the 1985 NCAA Championship game in Miami. While SPU rightly claims McCrath as its own (he coached there from 1970 through 2007), still another induction might be forthcoming. There are some National Soccer Hall of Famers who believe he should join them. Former Sounders FC coach Sigi Schmid, like McCrath, remembers the days when soccer was much more of a hard sell, and the pro game all but vanished. “People forget how difficult it was in those days, how we had to fight for things,” Schmid remembers. “Part of what kept soccer going in Seattle was Seattle Pacific, and he’s got to be commended for that rebirth. An ex-SPU and Sounders star, Peter Hattrup scans the contemporary soccer landscape, with Seattle seemingly the epicenter of the sport on this continent. For instance, much of the Sounders FC fan base consists of Boomers who as kids grew-up fans of the original Sounders. Who penciled the pro forma for that first ownership group? That would be McCrath (who predicted an average gate of 6,000 the first year; they averaged 12,000). Which program won more NCAA championships than the rest of the state’s put together? McCrath’s Falcons (1978, 1983, 1985, 1986, 1993). Who served as a front man for Paul Allen’s initiative to build a stadium to save the Seahawks and lure top-flight pro soccer back to the city? McCrath, whose stump speeches no doubt helped the soccer community pass the statewide measure. Virtually every Who’s Who of Soccer in Washington has benefitted in some way from McCrath’s contributions. Michelle Akers, like Keller, got invaluable coaching at his Northwest Soccer Camp early on. Later, after winning a couple World Cups for the U.S., she returned to coach. Chris Henderson, Sounders sporting director, and owner Adrian Hanauer each attended camp as well. Marcus Hahnemann’s 20-year professional career arced over the Atlantic and back. Yet before he met McCrath, his expectations were much more modest. Soon after Hahnemann was cut from the state select team, McCrath paid a recruiting visit to his parents’ Bellevue home. He left with Hahnemann’s commitment. Four years later Hahnemann departed SPU a three-time All-American and national champion; matured, married (by McCrath, an ordained minister) and set to play for pay. Some buddies recently quizzed Hahnemann about his best coaches. He played for some famed managers, both in the U.S. and England. His answer surprised them: McCrath, and for reasons most might overlook. Hahnemann was part of a powerhouse SPU squad in 1993, but at times the headstrong players proved a handful, even for the largely laissez-faire style of McCrath. Exasperated early on, the coach flung a stack of airline tickets at his inattentive players on the eve of a long road trip, telling them to “figure it out.” Twice that season he suspended key players. “He gave us leadership of the team, which is super important if you’re going to be successful,” says Hahnemann. Following the suspensions, Seattle Pacific ran the table, going undefeated in the final 10 games to claim the national crown. Before the season McCrath approached Hahnemann and his parents, asking them to take a smaller scholarship in his final year. “He convinced us it was a good idea, because we had freshmen who needed money and our program was out of money.” Hahnemann pauses. “You know who scored (the winning goal) in the final?” Answer: A freshman. Keller concurs; McCrath possessed a knack for management. Certainly winning attracts athletes who want to win. SPU was not flush with scholarship aid, however, and private school tuition far exceeds that of public institutions, such as its then-rival, Washington. Still, McCrath won more than his fair share of recruiting skirmishes until the mid-90s. He raised funds for expansive travel (24 states), something each player could experience. Moreover, he created a brotherhood, of men playing for one another, committed to a common objective. “He inspires people to want to perform for him,” says Hattrup. “It’s very much like Pete Carroll today. And Cliff never made you choose between hard work and fun.” His teams did plenty of each. “Cliff is a charismatic individual, and he made it sound exciting and he made you feel important,” shares Hattrup, who played on two NCAA winners before a distinguished pro career. The term ‘gift’ surfaces in any conversation explaining McCrath’s widespread and otherwise inexplicable success. “One of my gifts is encouragement,” says McCrath, citing a Biblical scripture from Romans. Many saw his SPU teams as over-achievers. The Falcons made it to 10 championship games, and nine times they were overmatched against teams with greater talent. “We were always this sort of underdog, and part of that can be blamed on me. I came out of an underdog life and culture,” he relates from his days as a Detroit youth. He got into his share of scrapes, including the incident with a dynamite cap that permanently severed three fingers from his left hand. Hence, Uncle Nubby. “Although I was intensely proud, I was instinctively thinking I could out-run, out-do other people, but I never felt I was better. I had to work harder.” His teams took on those same traits. Whereas most collegiate powers were comprised of more experienced, multi-national lineups, Seattle Pacific remained steadfastly reliant on natural resources. Days after the ’78 championship McCrath thanked Washington Youth Soccer leaders for developing 20 of his 24 squad members. Winning championships and being a great guy is all fine and good. But the fact remains that before the arrival of Sounders FC, McCrath single-handedly generated more media exposure for himself, his teams and the sport than any other soccer personality, before or since. Seattle Pacific went to 10 NCAA finals, winning three of four from 1983-86. In 1986, he was voted Seattle Sports Star of the Year, out-polling Seahawks, Sonics, Huskies and Mariners representatives after his team became Division II’s first to repeat. At the same banquet, McCrath’s impromptu series of jokes and jabs drew more laughs than the comedian for hire. 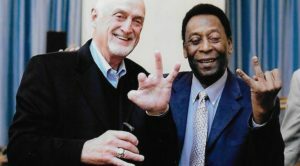 His appeal transcended soccer. In 1986 McCrath invited Schmid and his Div. I champion UCLA to play a midweek exhibition at Memorial Stadium. Thanks to McCrath’s popularity with the media, word got out and the game attracted 3,100. Two nights later the Bruins met the Huskies in an important counting match on Montlake. Fewer than 300 spectators showed. Finding the Falcons was not easy. They lacked a permanent home field for the program’s first 29 years before opening Interbay Stadium in 1997. In 1984 McCrath enticed the US. Olympic Team to Seattle for a friendly against FC Seattle, a semi-pro venture he helped found. The hook: Outfitting the Yanks in jackets, pants and ties from Nordstrom. Any account of McCrath’s exploits would be remiss without mention of The Crawl. Making good on a promise should the Falcons win the NCAA title in 1978, he climbed up and over Queen Anne Hill, on his hands and knees. Few celebratory stunts have been so grueling. On a brisk mid-December day he crawled 2.7 miles in just over three hours. Arriving at the base of the Space Needle, his knees were raw, his legs and arms aching. The final detail of the promise required that he shave his signature mustache on the spot. All the while TV cameras, photographers and scribes recorded the deed. Few may had heard of his team’s huge upset four days earlier in Miami. But by the morning following The Crawl, virtually everyone had heard of Seattle Pacific soccer and its audacious coach. Today, such an act would be trending on YouTube and Twitter before McCrath reached the counterbalance. A handful of NASL teams (including the Sounders, twice) tried luring McCrath into the pro ranks, but he always declined. He did accept countless public speaking opportunities and served on various boards and national committees. The camp continues, although it’s moved to Kenmore. “Other guys came and went, but Cliff’s been here the whole time, from the very beginning of the Sounders, to the stadium vote and everything that’s happened since. Ideally, his coaching career would’ve ended with the collegiate record for wins. As it was, his 597 (512 at SPU) was 10 from the top. After going winless in his first season, the Falcons reeled off 37 straight winning campaigns and 30 postseason berths, including 14 final fours. In recent years he’s served as executive director to a national soccer official’s organization and soccer-related non-profits as well as occasionally aiding his son Steve, the coach at Miami’s Barry University. More than a hundred of his former players went into coaching. Suffice to say, the gifts of Uncle Nubby will keep on giving.